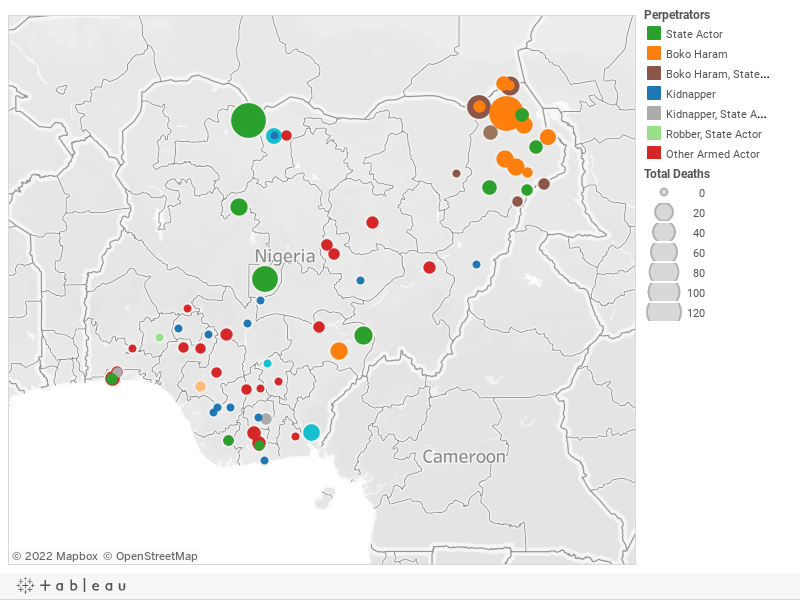 Below is a visualization and description of some of the most significant incidents of political violence in Nigeria from October 27 to November 2, 2018. This update also represents violence related to Boko Haram in Cameroon, Chad, and Niger. These incidents will be included in the Nigeria Security Tracker. October 27: Nigerian troops killed "scores" (estimated at forty) Boko Haram militants when the militants attacked a military base in Mobbar, Borno; one soldier was also killed. October 27: Pirates kidnapped eleven from a ship in Bonny, Rivers. October 29: Nigerian security forces killed thirty-five Shiites in Abuja. October 31: Boko Haram killed fifteen in Konduga, Borno. November 1: Gunmen abducted three health workers in Toto, Nasarawa.